During the late Qing (Ch'ing) Dynasty, parts of China began to rebel against the Manchu rule of the country. One of the largest uprisings was the Taiping Rebellion (1850 -1864 AD) which began in the southern part of the country. 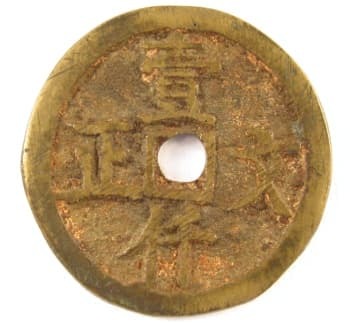 The Taiping government cast its own money and an example of this coinage can be seen at Peace Coins of Taiping Rebellion. 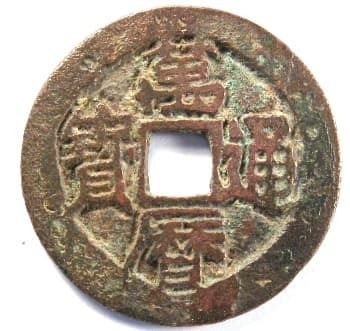 During this period of time, areas in Jiangsu Province also began to issue tokens. 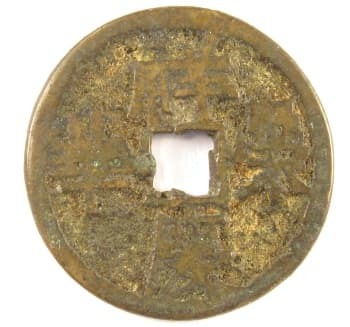 Tokens were not necessarily authorized by the rebel government but were typically issued by local authorities and merchants, such as the Zheng Lu Bridge tokens. 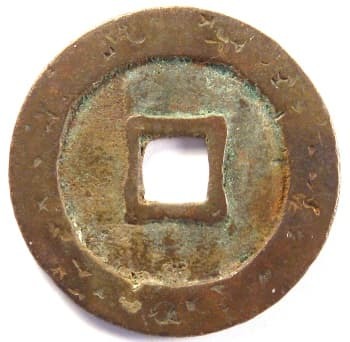 A "token" was considered to be the equivalent of a certain number of Chinese "cash coins". For example, a token may be the equivalent of 100 cash coins. Some tokens, however, represented 200, 500 or even 1,000 cash coins. The stated face value of a token was not always denominated as a certain number of cash coins such as 100 or 1,000. Because cash coins were small in value and many were needed for payments, for centuries it had become a custom to tie one hundred cash coins together on a string. This, in effect, made a string of 100 cash coins a unit of measure. Therefore, some Jiangsu tokens state their value as "one string" (yi chuan 壹串), "two strings" (er chuan 贰串), or "five strings" (wu chuan 伍串). In this case, a "one string" token was worth 100 cash coins, a "two string" token was worth 200 cash coins, etc. When one small copper token can be accepted as the equivalent of several hundred copper cash coins it is a sure indication that the monetary system is in turmoil. Of course, tokens were only good if local merchants, tax collectors, banks, etc. considered them as worth their stated face value. This would only be the case in the rebel controlled areas. What is most interesting about the tokens issued in Jiangsu Province during the late Qing Dynasty period was that, in addition to stating the monetary value on the obverse side, they included auspicious symbols or inscriptions on the reverse side. In this way, they were very similar to the charms and amulets which historically had resembled coins but also had good luck symbols and sayings. Displayed below are specimens of old Chinese tokens with values of 100 cash coins and 1000 cash coins. Some have special characteristics such as chop marks, charm features and auspicious sayings. The following are examples of Chinese tokens each worth 100 cash coins. For convenience, cash coins were typically tied in quantities of 100 with a string or cord running through the holes. These tokens are therefore the equivalent of one string of 100 cash coins. 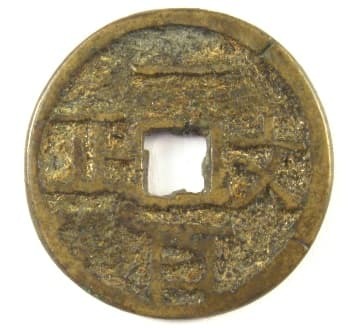 This is a most interesting example of a 100 cash coin token from the Qing (Ch'ing) Dynasty of the middle to late 1800's. The inscription reads bai he tong yuan (百合同元) and means it has the same worth as 100 of the primary currency, which were cash coins. However, this is a very unusual token because it has three types of chopmarks usually seen only on silver and other coins made of precious metals of this historical period. The first type of chop mark pertains to the edge cuts on the rim of both the obverse and reverse sides. Edge cuts were traditionally used to determine if a silver coin was silver throughout or only plated on the surface. This form of chop mark was rarely used on a copper coin or token. 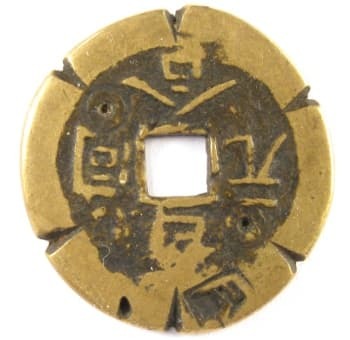 Moreover, it is important to note that there are six edge cuts making the token six-sided which is a characteristic of some Chinese charms and amulets. The Chinese consider the number six (6) as lucky because the pronunciation of the Chinese character for six (liu 六) is similar to that for the word "prosperity" (lu 禄). A second kind of chop mark has to do with the two test marks made with a punch just inside the rim. These test marks do not penetrate completely though the token. One small punch mark is at the 11 o'clock position and the other is at the four o'clock position. The purpose of test marks like this is to determine if the copper composition is the same throughout or only plated on the surface. 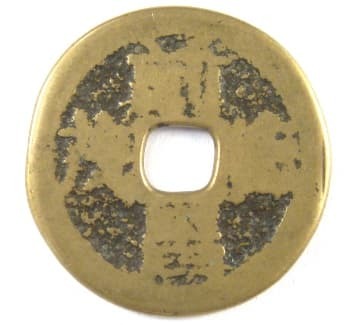 A third form of chop mark is the Chinese character stamped into the rim at the very top of the token. In the view at the left, the token has been rotated so that the chopmark can be read more easily. The Chinese character appears to be that for "moon" or "month" (yue 月). It is unclear, however, if this chop mark refers to a person, bank, company or government office. Although not common, it is not unheard of for copper coins to have chopmarks. 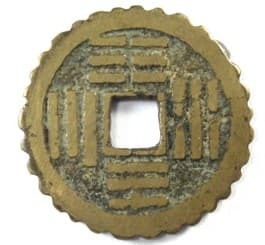 For example, there exist cash coins beginning from at least the years of the Wan Li reign (1573 - 1619) of Emperor Shen Zong of the Ming Dynasty with chop marks on the rim. At the left is an example of such a wan li tong bao (万历通宝) coin. While it may not be so obvious on the obverse side (far left), the reverse side (near left) of the coin clearly shows a number of chop marks on the rim. The chop marks at the one and two o'clock positions are particularly prominent. Unfortunately, the makers of these chop marks remain unknown. This coin has a diameter of 25 mm and a weight of 3.6 grams. This is the "reverse" side of the above 100 cash coin token. As can be seen, it is the same as the "obverse" side meaning this is a "double obverse" token. The only difference is that this side is flipped 180 degrees from the other side. The six side cuts are clearly seen on this side as well. Also, there are two test punch marks, one each at the eleven o'clock and five o'clock positions. Since this side is rotated from the other side, the punch holes do not line up with those on the other side. As is the case with the other side, this side has a single Chinese character stamped on the rim at about the five o'clock position. This chop mark also appears to be the character for "moon" or "month" (yue 月). The token has a diameter of 32.5 mm and a weight of 11.4 grams. 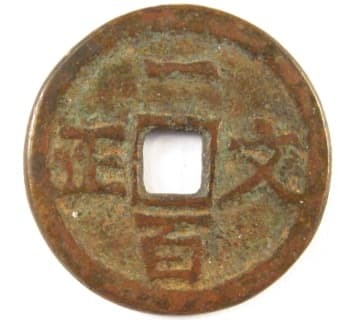 This is the obverse side of a Chinese token which resembles, and is about the same size, as the traditional round cash coin with a square hole. The inscription is read top to bottom and right to left as yi bai wen zheng (一百文正) which means "one hundred cash coins only". 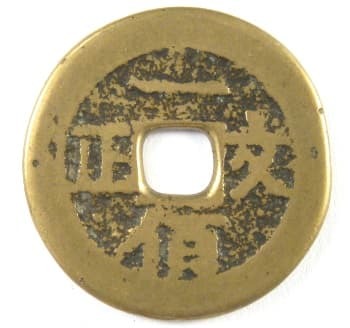 The character wen (文) is the measure word for cash coins. This token has a serrated edge which is very unusual for a token but which is explained by the Chinese cash coin with a similar edge displayed below. 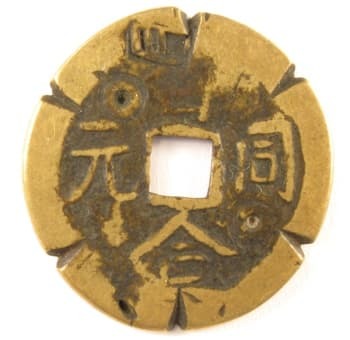 Chinese cash coins were cast round with a square hole in the middle. The coin at the left is a jia qing tong bao (嘉庆通宝) coin cast during the years 1796-1820 AD of the reign of Emperor Ren Zong of the Qing (Ch'ing) Dynasty. This coin was originally round but was later filed by hand so that it had a serrated edge. The reason for modifying the coin in this manner has to do with the way cash coins were carried and counted. As mentioned above, 100 cash coins (yi chuan 壹串) or 1000 cash coins (yi guan 一贯) were typically tied together on a string. But, payments of less than 1000 coins frequently needed to be made. To help alleviate the tedious task of having to count a large number of coins, specially modified cash coins with a serrated edge were used to mark the beginning and end of quantities of 100 coins or 1,000 coins. The Chinese refer to these coins as "teeth coins" (ya qian 牙钱). The actual number of "teeth" has no special significance and varies from coin to coin. 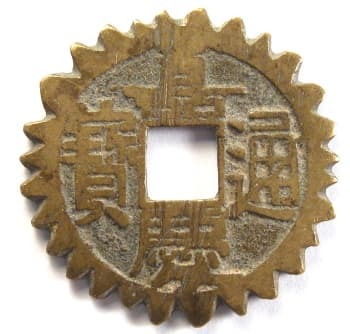 Since this Chinese token has the equivalent value of 100 cash coins, it was made with a serrated edge just like the real cash coin shown above. The four trigrams thus represent the four seasons. The hidden or implied meaning is that the token will "always" be worth one hundred cash coins. This token has a diameter of 27 mm and a weight of 6.3 grams. This is another old Chinese token with a value of 100 cash coins. The legend is the same as the token above, namely yi bai wen zheng (一 百文正) meaning "one hundred cash coins only". The auspicious inscription on the reverse side reads xiang qing rong hua (祥庆荣华) which can translate as "happiness and celebration, prosperity and high position". This token is 25.5 mm in diameter and weighs 6.6 grams. 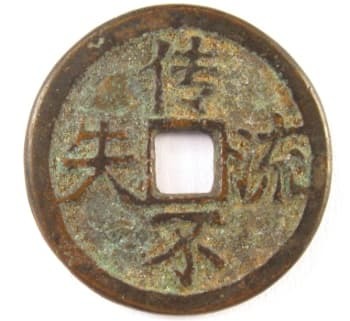 The legend on the obverse side of this very attractive token is also yi bai wen zheng (一百文正) which means the value is "one hundred cash coins only". 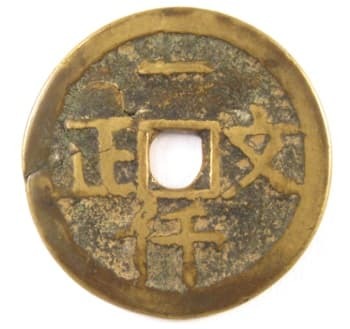 The inscription on the reverse is chuan bu liu shi (传不流矢) which means "(this token) circulates without losing value". The diameter is 30 mm and the weight is 10.1 grams. 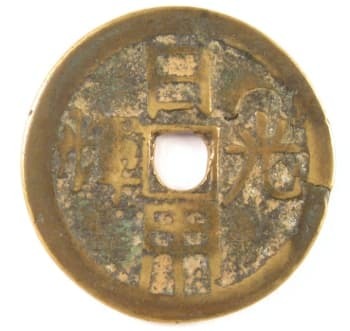 The obverse side legend of this token is again yi bai wen zheng (一 百文正) which means the worth is "one hundred cash coins". One difference is that the character for "hundred" (bai 佰) is written in the form normally used on paper currency or checks to avoid alteration. This token has clearly seen much use. Because of the wear on the Chinese characters, I am still trying to decipher the inscription. The character to the left of the center hole appears to be mao (茂) which means "rich and splendid". The token is 27 mm in diameter and weighs 6.7 grams. The following are examples of Chinese tokens worth 1000 cash coins or equivalent to 1 string of 1000 cash coins. 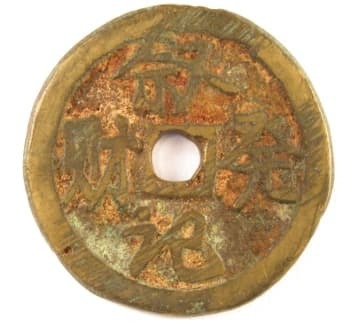 The legend on this token is yi qian wen zheng (壹仟文正) which translates as one thousand cash coins only. The character for one (yi 壹) is written in the formal style used on checks to avoid alteration, as is the character for thousand (qian 仟). The inscription on the reverse reads xu ji fa cai (叙记发财) which means "to talk about getting rich". The diameter of the token is 31.5 mm and the weight is 8.95 grams. 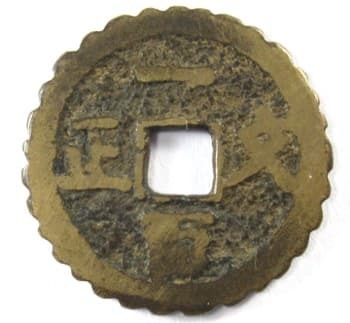 The legend of this token is yi qian wen zheng (一仟文正) which means (this token) is equal to one thousand cash coins. The inscription is slightly different from that of the token displayed above. In this case, the "one" (yi 一) is written in the more common style while "thousand" (qian 仟) is written in the more formal style to avoid alteration. The inscription on the reverse side is ri yong guang hui (日用光辉) which means "for daily use is glorious". The token is 29.5 mm in diameter and the weight is 8.3 grams.